We have even more sad news this morning. Fannie Lappas Blentson, owner of the lamdmark Blue Star Diner in Newport News, passed away at home in Newport News on Saturday, September 19, 2009 at the age of 77. NEWPORT NEWS - Fannie Blentson, 77, died at her residence on Saturday, Sept. 19, 2009. 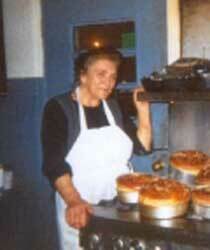 Fotini, affectionately known as "Fannie", was a native of Karpenissi, Greece. She was a resident of Newport News, and owner of the Blue Star Diner, for the past 46 years, and was a member of the Saints Constantine and Helen Greek Orthodox Church. She was also a member of the Ladies Philoptochos Society and a member of the Evrytanian Association of America. Fannie was preceded in death by her husband, Angelo Blentson of 33 years. She is survived by her daughter, Renie Thanos and husband, Panayotis of Long Island, N.Y.; son, Pete Blentson and wife, Laura, of Atlanta, Ga.; a sister, Anna Mageras, of Newport News; a brother, Yanni Lappas, of Karpenissi, Greece; five grandchildren; one great-grandchild; several nieces and nephews; and three godchildren. A Trisagion Service will be held at Saints Constantine and Helen Greek Orthodox Church on Tuesday at 7 p.m. with visitation following until 8 p.m.
Newport News, VA 23606, as a memorial. Published in the Daily Press September 21 to September 22, 2009. Without having known Fotini (Fannie) Blentson personally, her life unknowingly has enriched mine. Each July 15th anniversary of my marriage to King Meehan, we celebrated with a picnic on the Poquoson River, where the hit of the meal was always Greek Salad from the Blue Star Diner. People knew the best home cooked meals were found wherever trucks and trailers parked. For decades we knew it was Blue Star Diner on Warwick Boulevard. Fannie's story from life as a Greek immigrant, to US citizen owning and operating a successful business for many decades, is inspirational! Her dear friend, Pat Perkinson, has shared with me enough details to boggle my mind. Her life on earth was filled with friends, admirers, and remarkable achievements. may she rest in Peace. We were so sad to hear of Fannie Blentson's passing. Our hearts go out to her entire family. We didn't know Fannie personally but had a special connection with her after the death of our precious David that she seem to take under her wing and he was a friend of Pete's son. Fannie showed up at David's funeral with her grandson and I was so surprised and pleased. And it seemed she had a closeness with David that we weren't aware of. We went by the diner a few times after the funeral and she was always generous to David's son, Heyden, that he left behind. We had the pleasure of seeing her at the Blue Star Diner the many times through the years that we ate there or just went in for a pick up of her famous Greek Salad. We have many memories of her and her establishment that is a land mark of history for Newport News. What a wonderful lady Fannie was and she will be sadly missed by all who was fortunate enough to cross her path. The diner hasn't been the same since she left. I will always remember Fannie Blentson as a wonderful, talented, and kind, woman. She continuously did for others - always helping & giving. If someone needed a loaf of bread, she would bake them ten. That was her style........generous, strong, loving. We will miss her. Our deepest sympathies and prayers are extended to Fannie's family and friends.